Authors notes and comments on the science behind Killgrace and the Singular Situation, a science fiction novella involving space, black holes and a nebula. "Solar winds and steel chains are a difficult way to rescue a creature the size of a planet from the grip of a black hole. When the creatures in difficulty are something neither Susan or Cet have seen before, staying uninvolved is not an option. Gravity and relativity are not the only problems they face: there's also getting the would-be rescuers to work together." 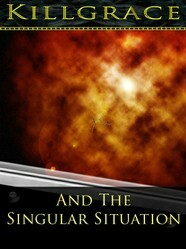 "I really liked the original type of sci-fi adventure going on in the story"
A science fiction novella available from Amazon, Singular Situation covers a rather unique rescue in poor conditions. This lens includes background detail and author's notes, although spoilers will be avoided where possible. Killgrace and the Singular Situation is a science fiction novella available in Paperback, .epub and Amazon Kindle. It is available from sites worldwide. The sections below cover some of the back notes for Singular Situation. Spoilers will be avoided where possible, but some may still be present. If you really want to avoid them, read the book first. Which is your favourite ship? Of the four ships featured in the story which is your favourite? Singular Situation takes place within the accretion disc of a black hole. 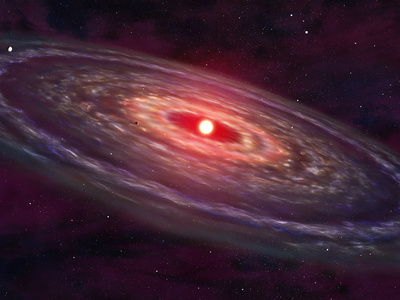 An accretion disc is made up of the matter the black hole has attracted, for example the remains of a partner star or nearby system. This matter orbits the hole and is slowly drawn inwards by the gravity of the black hole. At its outer edges this can be as diffuse as a nebula - far less dense than our own atmosphere. As the matter gets closer to the black hole, the gravity increases. The matter is compacted by the pressure and heats up, beginning to glow. As this matter is still outside the black hole, light from it can travel outwards, making it visible and also hiding the black hole itself inside a mass of luminous matter. Do you think humans will develop publicly known artificial gravity in your lifetime? Two forms of artificial gravity are in use in Singular - rotation and gravito-magnetism. These aren't just soft sci-fi investions: both are theories in use or development. Ironically, given the problems the characters face are caused by natural gravity, artificial generation is a background detail. Practical experiments today towards artificial gravity include the notable frog experiment. Using diamagnetism, Andre Geim successfully levitated items - including a frog. He received a Nobel prize for levitation, and an Ignobel prize for levitating a frog. The Mally and larger ships create artifical gravity through gravito-magnetism, a phenomenon real-world scientists at ESA and NASA are studying. For obvious reasons, generating enough force to counter the pull of a black hole, is not going to happen but for anyone curious about how it works, the video below gives a good explanation. If I went into it myself here it would take up half the article on its own - it's a fascinating field. Using rotation to simulate gravity has been a popular idea for years, discussed since the turn of the twentieth century and featured prominently in Sci-fi titles from 2001 to Babylon 5. For those not familiar with the idea, when an object rotates, centrifugal force pushes outwards e.g. if you spin a bucket of water round fast, this is why the water stays in the bucket. If a space station spins at the correct rate, objects inside will be pushed towards the outside, simulating gravity. There are a few problems with this - the amount of force (and therefore gravity) varies depending on how close to the centre you are. It can also cause dizziness and sickness when moving between different levels of force. The human inner ear does not like being in a spin! In this 1968 trailer for 2001 Rotational gravity can be seen at 1:45 & 2:25 - and I do recommend the film! The Renshaw was based on the principle of the modern tug boats in use to assist larger vessels during delicate manouveures. Entering planetary orbit, a large liner may not be able to move itself effectively, or energy efficiently. For these smaller moves a tug boat, capable of exerting force to adjust the course exactly as desired, would be a logical addition. Such ships would also be useful for rescues, as shown in the story, when something is unable to move itself. The Renshaw has probably been used on more than one occasion to nudge a stray asteroid away from a planet. A small, powerful, manouverable engine has a lot of uses - especially in space where the lack of inertia means a little well-placed force can go a long way. Real-life tugboats may be moving in two dimensions, not three, and using ropes not magnetic grapples, but they are incredible pieces of engineering, capable of moving ships that out-weigh them twenty times or more. That's all for my notes for now. If you have any questions you can reach me through the comments below, or join the community at the Killgrace boards to discuss this and the rest of the series.